Tynemouth’s first team game at Whitburn was rain interrupted and shortened. Both the Second and Third team games on Saturday could not take place. Having dodged the rain all day, spectators at the lovely, tree-lined village ground in Whitburn were treated to an exciting finale. 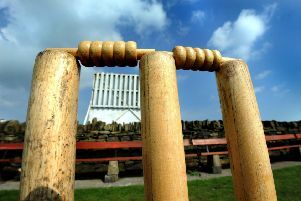 With just two overs remaining Tynemouth lost their eighth wicket on 148 and needed an unlikely 12 more runs to clinch the winning draw. However some fine ball striking from David Hymers and some dogged defence from Henry Malton got them home off the second last ball in a tense finish. On a wet and showery day skipper Ben Debnam had no doubt about asking the home team to bat first on what looked a wicket likely to suit the bowlers and so it proved most of the day. The first half of Whitburn’s innings saw wickets falling regularly but at the other end Dan Shurben playing with great application and always punishing the loose ball. At 86-5 Whitburn looked in trouble, however with Shurben still at the crease he found a willing partner in Mark Elliott who, after a cagey start, worked hard to support his experienced skipper and began to score well to leg. A 50 run partnership was ended when Shurben was caught by Sam Dinning off the bowling of Martin Pollard. However the tail wagged and when last man Dan Quinnen was out Whitburn had posted an above par score of 181. Pollard was the pick of the bowlers, showing improved form and great control in his spell of 3-32 off 11 overs. The away team’s reply did not start well with both openers back in the hutch with only 12 on the board. Northumberland new boy Matthew Brown then steadied the ship with Sam Dinning taking the score to 67 before he was bowled by Smith for 17. When Andrew Smith was caught behind from a brutish ball from the same bowler, Whitburn hopes of a win were raised with the score at 77-4. With the game finely balanced, Chris Fairley came to the crease to join Dinning and, after a slow start, began to hit the ball well and edging his team closer to victory. Dinning at the other end was rock solid and his 61 was a fine effort and hopefully a springboard for a successful season. Fairley made 39 but again wickets tumbled after his departure resulting in a nervy finish. However, this was a decent result for Tynemouth and their delighted supporters. Credit is due to both Smith and Waterson who bowled well for Whitburn throughout. The result maintained 4th position in the League for the Tynesiders and they’ll be looking to improve on that next Saturday with a home fixture against Newcastle. The game begins at 12:30, admission is free, spectators are welcome and the bar is open.